If a camera could be called legendary, it would be GoPro's HD HERO Naked. Still a hot seller after several successors and competitors, the HERO Naked packs features that changed the landscape of the action camera market. The HERO Naked is a stunning action camera that makes leaps in bounds in video and audio quality. While it has its shortcomings (regarding its interface in particular), its stunning results make it one of the best action cameras on the market. The form factor of the HERO Naked is small, simple, and sturdy. The camera itself measures 1.6 inches x 1.2 inches by 2.4 inches and weighs a reasonable 3.3 oz. The included waterproof housing adds a bit of bulk and heft, but with the added benefit of making the camera weather-resitant and waterproof up to 60 meters. The camera's front features an LCD, a combination power and settings button, and an LCD that indicates when the camera's recording. The top of the camera features the shutter button, the right side holds the SD card slot, and the left side are the ports for connecting to a computer or HDTV. GoPro's pulled no punches in making their HERO Naked the next evolution of their flagship cameras. The HERO Naked features full HD video with a maximum supported frame rate of 30 frames per second. The camera also takes video at 30fps 960p and 60 fps 720p, allowing for smoother video in exchange for a minor hit in frame rate. GoPro's trademark fisheye field of view (FOV) is supported at all resolutions, though it's reduced to 127° from 170° in 1080p mode. In other words, your videos will have less of a focal point, but it's a fair trade-off for truly high-definition video. The HERO Naked doesn't just take high-resolution videos, it takes high-quality videos. Footage is clear and vivid, even in low light conditions. The camera's Spot Meter setting adjusts the camera's exposure when filming bright settings from within a dark setting. Dark settings show a bit of noise, but overall it's a substantial improvement from GoPro's previous offerings. The HERO Naked supports a single resolution of 5 megapixels (MP) for still photos, which is more than enough considering the quality of the image. Images can be taken at intervals of 2 to 60 seconds, in triple shot mode, or set to take a photo after a certain time. The HERO Naked has a decent battery life of 2.5 hours when used constantly, although the battery charges in less than an hour when plugged directly into a wall charger. The camera can also be used while the battery's charging. An interesting addition from GoPro is the integrated battery heater, which keeps the battery warm during winter activities. GoPro's revamped the quality of their microphones for the HERO Naked. Rather than limiting your video's audio track to wind, the HERO Naked picks up voices and other sounds with a surprising amount of clarity. Audio quality suffers when the camera is in its waterproof casing, so you'll only have the benefits of clear sound during dry days. The HERO Naked includes an expansion port known as the HERO BUS for extending the camera's capabilities. Modules known as BacPacs can add an extra 2.5 hours of battery or even an LCD screen for view-finding and looking through previous images and videos. The HERO BUS adds some much-desired flexibility and customizability to an already feature-packed camera. Your camera's contents can be transferred to your computer through GoPro Studio, a desktop software suite for managing and editing photos and videos. While you don't need GoPro Studio to enjoy your images, the software will let you easily manage, play back, crop, and adjust color settings on video and images through a single interface. 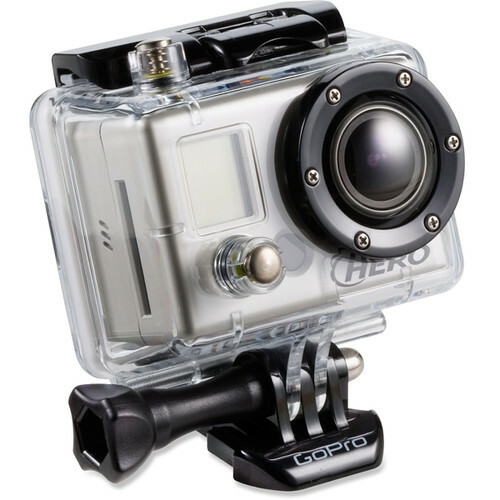 The HERO Naked represents a quantum leap in the performance and capabilities of GoPro's cameras. Featuring a lightweight design with add-on flexibility, fully high-definition video, and excellent sound and picture quality, it's rare to find such a rich offering in such a small package.